​In terms of copyright storing teaching material on a computer network and distributing it on a computer network always means both creating a work and making it available to the public. A closed network environment such as an internal network, does not qualify as private use referred to in the Copyright Act, but the inclusion of copyrighted material on the network requires an applicable exemption or permission from the rights holder. The general conditions for the application of the limitation provisions are laid down in Section 11 of the Copyright Act. Utilisation of the limitation provisions requires that the work to be quoted is made public, that the source and the author are mentioned in the way that proper usage requires, and that the exploiter has legally gained possession of a work or other material. The work has been made public when it has been made public with the permission of the creator, for example at an exhibition or on an open web page. The requirement of a legal source for example, means that a web page from which the image is downloaded is such that the image is there with the permission of the rights holders. If the image was originally unlawfully loaded on a web page, copying images is not permitted under the quotation right. For example, if a teacher has photographed an image, for reasons of clarity it is advisable to indicate his / her own name, for example; photograph: Tim Teacher. In addition, the architect, designer, artist or performing artist of the subject in the image should be mentioned. The second paragraph of Section 25 of the Copyright Act refers to the quotation of images. According to the regulation, images may be reproduced without permission and without compensation for a critical or a scientific presentation, provided that the images have an appropriate connection with the text. In addition to the conditions set forth in Section 25 of the Copyright Act, the use of the right requires that the previously mentioned general conditions are met (Section 11): the quoted work must have been made public, the name and source must be mentioned, and the source must be legitimate. The work is public when it has been made public with the permission of the author, for example, in an exhibition or on an open web page. The requirement of a legal source for example, means that the web page from which the image was downloaded is such that the image is there with the permission of rights holders. If the image was originally unlawfully loaded onto a web page, copying images is not permitted under the right to use the quotation. The image can be a photograph, a drawing, a photograph of an artwork or musical notation, a diagram or other explanatory drawing or other type of image. Section 22 of the Act mainly concerns the use of parts of a work, while Section 25 permits the use of the image in its entirety for non-commercial purposes. If the conditions of Section 25 of the Copyright Act are not fulfilled, the quotation may perhaps still be made under Section 22 of the Copyright Act based on the general quotation regulations. According to Government Decree 287/1994, p. 29, the criteria for a scientific presentation in the law enforcement practice have become relatively broad. A presentation is considered scientific if the manner of presenting the subject is scientific. 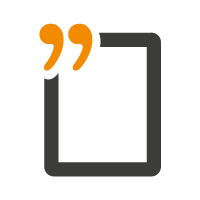 For example, the fact that an image illuminates the lecturer's verbal presentation during a lecture at a university or a polytechnic is a basis for quoting an image. According to statement TN 1992: 4, by the Copyright Council, for example, in Valtatieverkoston 2010 kehittämissuunnitelma, a publication by the Public Roads Administration, Impact Assessment 5 was a scientific presentation. The scientific value of the presentation can also be based on the systematisation, choices and manner of presentation. Similar criteria will also be used to evaluate digital teaching material or a thesis. A lecture based on scientific research is a scientific presentation to which the limitation clause in Section 25 of the Copyright Act is applicable and which, accordingly, may be accompanied by illustrative images of verbal expression. If a presentation in a digital educational material is to be a scientific proposition, it must have sufficient analytical analysis of the material and the use of the sources in accordance with good scientific practice. Here you can find more information on how to report sources and factors in a good way. 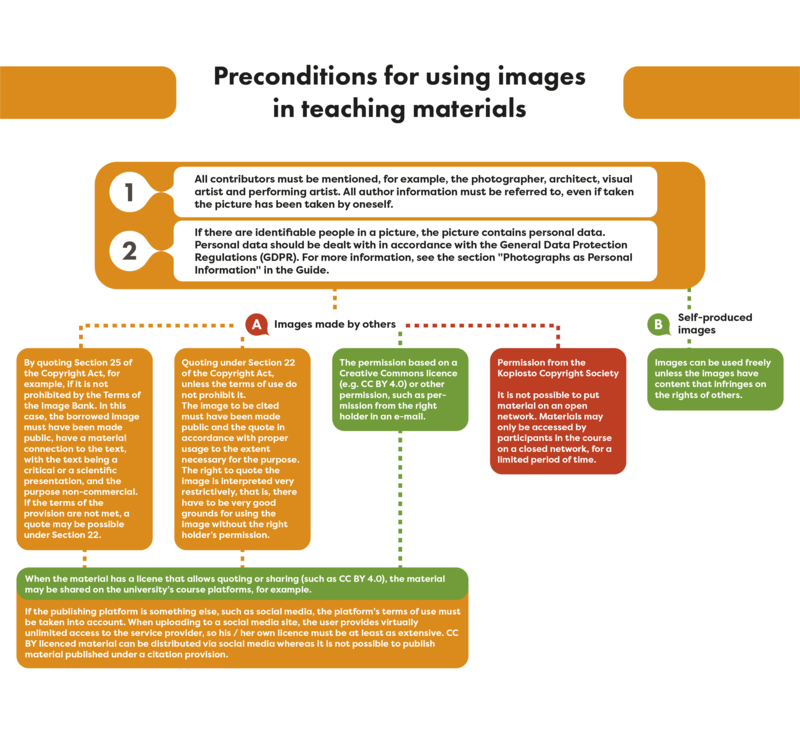 In this case, the ability to illustrate the scientific presentation under the restriction provision is also suitable for digital learning material. When a work is published in accordance with Section 22 of the Copyright Act, in accordance with proper usage, borrowing quotations is allowed to the extent necessary for the purpose. In addition to the previously-mentioned general conditions (the contract does not prohibit citation, the cited work has to be public, the name and source must be mentioned, and the source must be legal), the conditions of Section 22 have to be fulfilled. In this case, the borrower does not have to ask the rights holder’s permission to use his / her work as part of the borrower's own work or to pay the rights holder compensation for the use of this work or part thereof. This regulation provides you with the right to use copyright material in another context as part of a new work. The citation right applies to all types of works, that is to say, under Section 22, you can also quote pictures. In addition to the general conditions, the citation must meet the requirements of proper usage to the extent necessary for the purpose. The most important meaning of proper usage is that it requires a material connection between borrowable and borrowed works. The requirement of a material connection concerns the relationship between the borrowed and the borrowing work, that is, the purpose for which quotation is permitted. For example, using a picture in a public status update for social media could not be considered to be proper usage. However, in lecture materials, using someone else’s photograph to illustrate the materials and distribute it on the open learning platform of the university, the quotation would in principle be proper usage. For there to be a material connection, it is therefore essential for the work to be quoted to illustrate, clarify or provide background to the borrower's own presentation. Due to the absence of a reference function and a material connection, it is not permissible to create a work composed of plain quotations without the permission of the rights holder (Harenko, Niirala and Tarkela, Tekijänoikeus, 2016, pp. 203-205). The expression ‘to the extent necessary for the purpose’ is assessed on a case-by-case basis and means, for example, the length or purpose of the quote. The proper use of citation has been evaluated in the statement of practice by the Copyright Council. In the statement by the Copyright Council 2016:16, six photographs and related captions were used in an article about a photographic exhibition and a photography book. In this case, images and caption texts could be cited under Sections 25 and 22 of the Copyright Act, as the images and texts contained a sufficient connection with the text of the article. The permissibility of citing has also been evaluated in the Supreme Court's decision concerning the musical work ‘Lapualaisoppera’. The solution has been discussed, for example, on the Turre Legal Parody website. If you wish to use third-party material more widely than the quotation regulations permit, or if the licence terms prohibit the use of images, you can also ask permission from the rights holder, for example by email or he / she can give permission in an agreement. Also, obtaining permission from Kopiosto allows you to provide limited access to the material among the participants of a course, for example in a closed Moodle session. It is recommended that you make use of Creative Commons licensed material as much as possible in your own material, as CC-BY licensed material can be widely distributed, for example, on open web platforms. Linking is not specifically regulated by Finnish law and therefore it has to be assessed on a case-by-case basis under copyright law, for example. In the linking debate, maximum freedom of linking is almost always defended with the argument that Internet activity and freedom of expression require linking options. Thus, the possibility of linking without copyright hindrance has been welcomed in principle. However, the significance of the freedom of speech is very limited in cases where illegal material is linked. (Pihlajarinne, Taina: Lupa linkittää – toisen aineiston hyödyntämisen tekijänoikeudelliset rajat. 2012, pp. 72-73 and 80). If protected material is imported from outside to a site through links in such a way that it forms a part of the linker's page, a new work has been created, from a copyright perspective. Setting a frame link, an inline link, and an order link indicates that the linker will re-submit the material to the public (Pihlajarinne, Taina: Lupa linkittää – toisen aineiston hyödyntämisen tekijänoikeudelliset rajat, 2012, pp. 113, 126). Hence, if such technology is used in social media, for example, linking technology may be a violation of the rights holder's copyright. However, if a source site, for example, has a social media share feature, it is to be interpreted in principle that the rights holder has given permission to share.